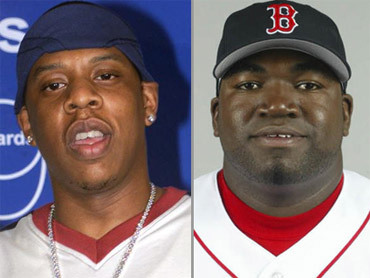 Jay-Z and a business partner are suing slugger David Ortiz, claiming the Boston Red Sox star named his Dominican nightclub after the mogul's chain of 40/40 clubs. The lawsuit, filed Thursday in Manhattan Federal Court, accuses Ortiz of naming his Santo Domingo club Forty-Forty in the hopes of trading in on the rap star's fame. The suit seeks over $5 million in damages and for Ortiz to forfeit any use of the 40/40 name. Jay-Z's string of bars can be found in Manhattan, Las Vegas and Atlantic City. "David Ortiz is fully aware of Plaintiff's Manhattan 40/40 club, since he had been a patron there on several occasions before he opened his Infringing Forty/Forty club," the lawsuit states.